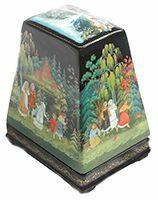 This five-sided box is a creation of Ludmila Gelisheva from the village of Palekh. Its sides and lid depict different scenes from the popular Russian fairy-tale "The Snowmaiden" or "Snegurochka". The work is a good example of intricate Palekh art. The Palekh tradition of the black lacquer exterior acting as the background for the scenes works wonders for the palette and the decoration. The greens and blues become electric, the reds and oranges passionate. Hair thin gold and silver accents have been used extensively throughout the composition adding rich luminescence and delicacy to the piece. The Snowmaiden's figure is painted to look transparent to remind the fact that she is the daughter of nature. Under the spring sun, Snowmiaden start melting and finally appear in a sky as a cloud. The box is constructed from paper-mache. The exterior of the box is painted with black lacquer while the interior is completed with dark red lacquer. The exterior is decorated with nice gold ornaments. The lid is hinged and the box rests on the four legs. The work is signed with the artist's name and the village of Palekh and the year of 2016.